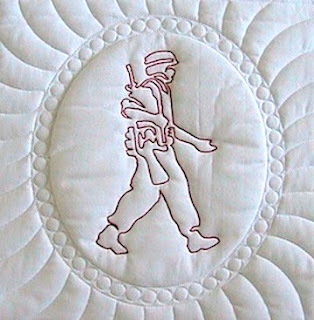 This is just inspiration to try more than just quilting with your iQ. I have not given step by step instructions. 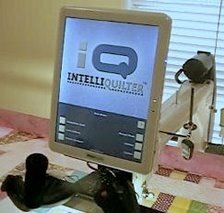 It is possible to create embroidery-like effects, from simple fabric embellishment to more complex filled patterns, with your quilting machine and iQ. 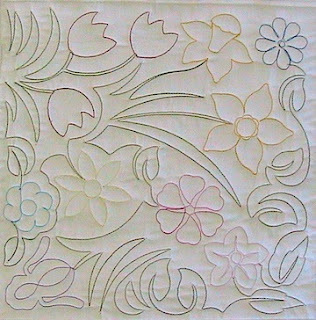 All of these techniques can be used on quilts but they can also be used to embellish plain yardage. Use a thick thread in the needle, such as Jeans Stitch. Stitch out a practice piece to test the tension. Redwork can be quilted or stitched on yardage, but remember the yardage will be pulled in by the stitching. Starching the fabric heavily or adding a removable stabilizer will help. I used undiluted liquid starch to stiffen a single layer of fabric. It felt as if I was stitching through paper but there was no draw up. I washed the fabric after completing the stitching and was happy with the results. These embroideries can now be pieced into a quilt. When doing simulated redwork as part of the quilting, stitch in the ditch on the block outline first to stabilize the quilt. Stitch the motif next then finally any background fills. You may need to realign before stitching the background fill. Also double check that the background fill isn’t going to extend beyond the edge of the block by watching the crosshairs as you move the machine around the block. If the fill extends too far, create a clipping block to trim away the excess. Leaving a small gap between the motif and the background fill is more forgiving. Ideas: Use Razzle Dazzle thread in the bobbin and stitch the redwork upside down. Double or triple stitch the pattern if you do not have thick thread. Stitch out motifs using multicolored or variegated thread but for a more embroidered look, change threads throughout the pattern. This works well with flower designs. Split the pattern where you want to change the thread color. When you sequence the stitching, select all the areas that will use the same color thread and select stop to cut threads as the transition. This gives you the opportunity to realign between each section. 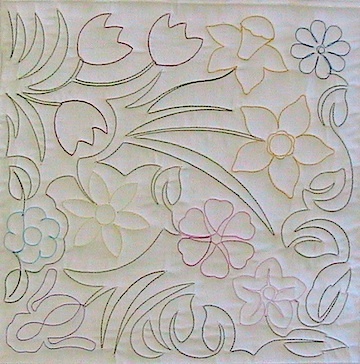 In the floral sample, I stitched all the green leaves first, and then changed top thread colors for the flowers. I found I had to realign before stitching each flower because the green stitching had pulled in the fabric slightly. 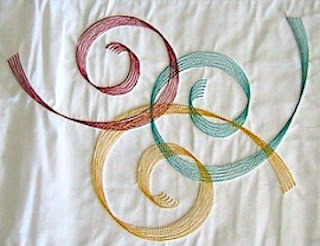 Filled Embroidery Patterns using Spiraling echoes. Use this for a true filled embroidery look. Echo each interior space with a tight spiral. After placing the echo in one space, touch ‘accept’, not finished. This will take you to the transition page where you’ll choose ‘spiral’ then touch finished to return to the echo pattern page. You can continue doing this until all the spaces are filled. Each tight spiral fill should be stitched from the outside to the center to minimize distortion. 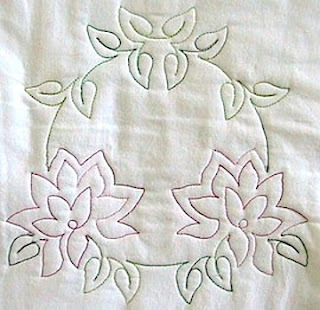 When stitching a pattern like the Betty Flower pictured, begin by stitching the yellow center. Before stitching one of the red petals, realign to the center of the flower. Realign every time before stitching another element. To get the best coverage, design and save the filled pattern at a larger scale than you intend to stitch it out. Ideas: Only stitch filled spaces, not the actual pattern. Fill and stitch parts of a design, not all of it. Play with multi-colored thread starting a filled area with the same color so that every area has the same interesting striped effect. Choose a simple pattern and turn it into a fan pattern. Reduce the angle to 1º. Grab the start point and move it around the screen. Try this with a simple curl – see how it resembles a ribbon? Now try this with other patterns. The angle between the repeats can be smaller than 1º if a more solid look is preferred. Couching is when a thread is laid on fabric then stitched down with another thread. Path pattern is a fast way to set couching in place. I chose to couch a heart so I placed a heart pattern in a block then used the heart as the path. I chose arc-2 and increased the repeats to 50, which reduced the scale of the individual repeats making them more suitable for couching the yarn. I stitched the heart pattern first so I knew where to place the yarn. As IQ stitches the path pattern, hold the thread, yarn or ribbon in place so that the stitching goes over it. (It is couched.) Set IQ to move slowly so that you can adjust the decorative thread easily. Alternatively, the couched thread, yarn or ribbon can be glued in place first. Use line pattern to mark the position of the couching if you want it to cover a seam line, for instance. Trace along the seam line using line pattern then select that line pattern as the path. Use either arc-2 or half circle2 for the couching stitch because an undulating line will stitch out more easily than a zigzag. 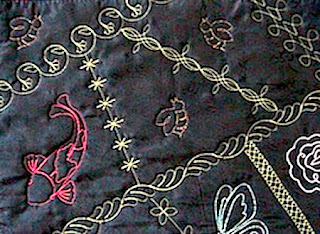 Other stitches work well for decorative couching especially when couching ribbon – try a figure 8, pearl or other simple patterns. NOTE: if a couching foot is available for your machine, it's not necessary to follow these steps. However, I have found that my Gammill couching foot will only allow me to use one thickness of yarn or cord. To couch ribbons or fancy yarns, I'd still use the path pattern method. There are many crazy quilting stitches for sale but you can create your own with line pattern or by using the geometric catalog patterns. Many sashing or border patterns work well as crazy stitches when they are reduced to a small size. 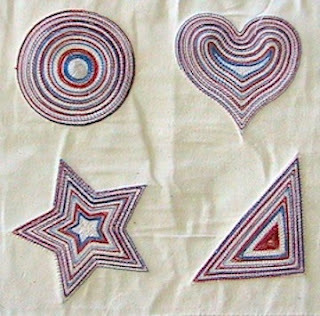 Embroidery is done along the seam lines of crazy quilts, so place the pattern a combination of line pattern and path pattern. Mark the seam line as a line pattern then use that as the path for the decorative stitch. Embellishing yardage for clothes, bags and home decor items. Fabric for clothing – load a single layer of fabric and keep it taught. Don’t overstretch it. This should be enough fabric for all the pattern pieces. 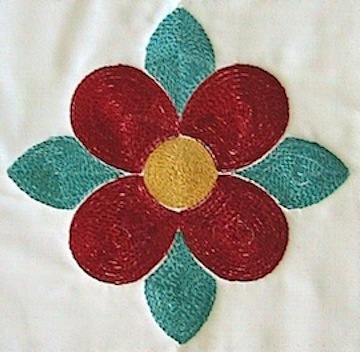 There’s no need to mark the pattern pieces on the fabric – you are simply embroidering yardage. Choose a pantograph and cover the whole fabric with the pattern, just as you would a quilt. Use strong thread – clothing stretches as you wear it and the thread will break more easily than it does on a flat quilt. When you take the fabric off the machine, it will pull in a little and cause the fabric to bubble but this can usually be pressed out. Try loosening the thread tension to minimize the bubbling. However, this bubbling can add an interesting dimension to the fabric. Starching the fabric heavily will prevent the stitching from drawing in the fabric. Bags are often made of three layers like a quilt so the bag quilt yardage will be stitched before cutting out the pieces for the bag. A single layer of fabric could also be embroidered for a bag either with an edge-to-edge pattern or with motifs. When stitching motifs, think about how much fabric you’ll need for the whole pattern piece to ensure the motif is in a place that allows you to cut out the bag with the stitching in the correct position. Alternatively, stitch a motif that will be used on an outside pocket. Home Décor -Fabric for curtains or pillows may be heavier weight so will not draw up as much a fabric for clothing. It’s still important to keep it taught. 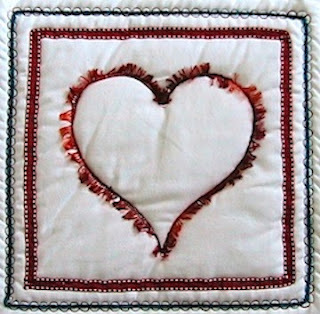 Decorative pillows can be like small quilts – quilt/embroider the front panel then make up the rest of the pillow cover. Ideas: Stitch a pattern along one edge of the fabric; add a pattern to a pillowcase, sheet edge or towels. 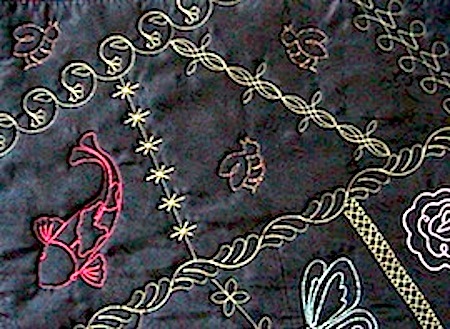 Embellish fabric for a pelmet or valance – this could be quilted or just a single layer of fabric. Many designers sell patterns for bags, aprons, baby items, placemats, Christmas stockings and tree skirts.